Patchmaker returns with a fresh installment of EDM presets for modern music production. This set is inspired by artists like The Chainsmokers, Diplo, Yellow Claw, Dillon Francis,DJ Snake, Major Lazer, and more! This incredible collection offers 70 presets (35 Serum & 35 Massive) that capture a wide range of sonic goodies and has all you need to take your tracks to the next level! Producers searching for the sounds to make not only EDM but any other genre like trap, future bass, even drum & bass, would benefit from investigating the content of this pack as there are many interesting sounds that would fit different genres. 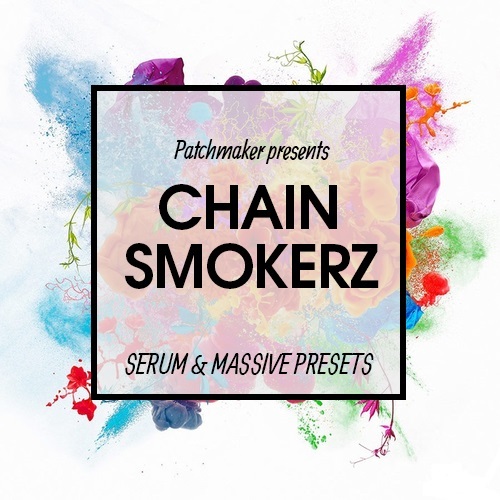 In detail "Chainsmokerz" contains fat and thick synths, epic leads,dark basses and everything you may need to produce a great track and push up your producer skills. Every preset has all macros (4 macros for Serum and 8 macros for Massive),so you will be able to tweak them at your own preference and and get better results. This is an absolute must-have pack for any serious EDM producer. Also this pack has bonus presets that were used in the demo.